Most American Christians have identified smoking or chewing tobacco as sinful, but what is the Biblical basis for this conclusion? There is no verse that says “Thou shalt not smoke.” So why should we think it’s morally wrong? The two reasons I typically hear are related to (1) health and (2) addiction. Regarding health, the verse appealed to is often 1 Corinthians 3:17 in which Paul says God will destroy those who defile the temple of God. The temple is understood to be the human body, so anything that destroys the human body is sinful. I’m not convinced this is the right interpretation of the verse, but let’s run with it for the sake of argument. There’s no question that smoking cigarettes is not good for the body. It’s unhealthy and thus unwise, but is this enough to warrant considering it sinful? How many other things do we consume that are unhealthy for us? Are we prepared to call too much consumption of chocolate, ice cream, soda, red meat, and the like sinful as well? These are also unhealthy when consumed too much. One may object that while these things are unhealthy, they do not typically kill the person who consumes them. That may be true of each item individually, but not necessarily as a whole. A person who consumes too much sugar, fat, etc. often develops diseases such as diabetes or cancer, and some die as a result. If we’re not prepared to consider it a sin to eat too much ice cream or drink too much soda, then why are we so quick to consider smoking a sin? Perhaps we should consider both to be sin, but I doubt most would see it that way (you can pry my ice cream container away from my cold, dead hands!!). 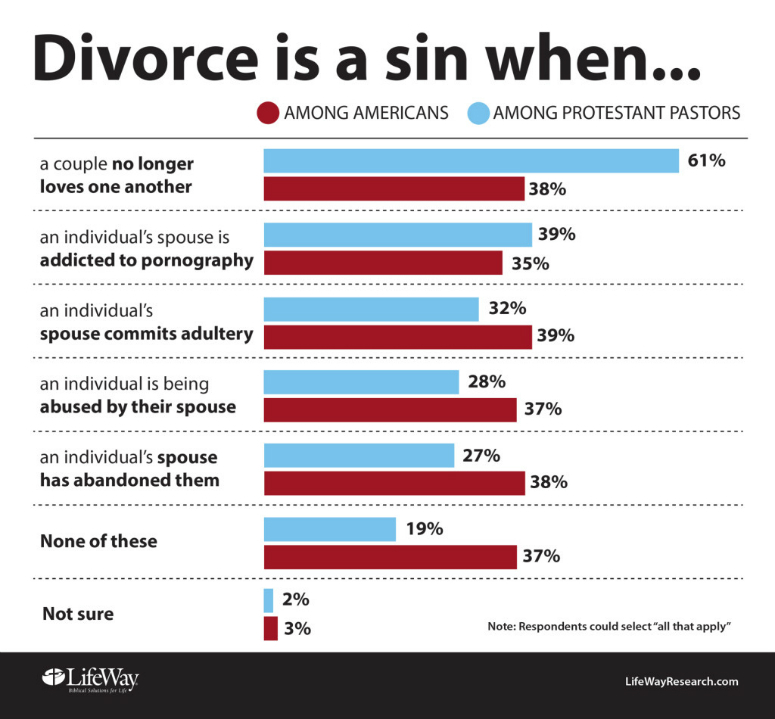 LifeWay Research conducted a survey of 1000 American adults and 1000 Protestant pastors to get their take on what is considered a justifiable divorce and what is not. Only 38% of Americans think it is a sin to get a divorce on the grounds that a couple no longer loves one another. It’s no wonder we have so much divorce.